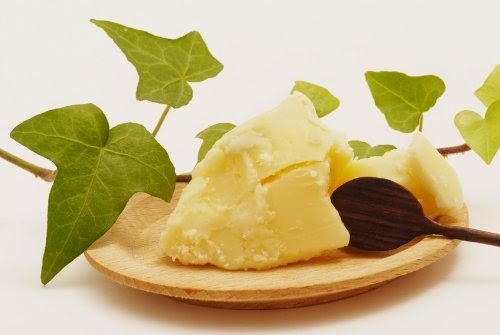 #1 RATED SHEA BUTTER ON THE MARKET! Natural Relief from Dry Skin, Psoriasis Dryness, Eczema and Acne. Excellent for Stretch Marks for Pregnancy or Other. 100% Natural and Organic Pure Shea Butter - Made with Hand Selected Finest Nuts of the Shea Tree in Ghana. Very please with how much you get... 1 pound! And, a little really does go a long way, this container will last me for awhile. I also like that it is all-natural and not that expensive. It is thick and a little hard, like a bar of soap hard, but I just firmly rubbed my fingers across it and gently pressed it against my skin. At first I had a hard time rubbing it into my skin, but you just have to really rub it in... I got the hang of it. I used it on my driest parts, like my elbows and the heals of my feet. It worked really well. After only a few uses, I really noticed a big difference. The only big downside was that it is really greasy and the label says it's not. And, I'm not talking a little, after I use it, my hands are so greasy that I need to wash them with soap to get it off. And, the places I put it on, I really needed to rub it in, but still had to let dry for awhile before putting on any sort of clothing. It leaves a residue and is very slick. I would recommend only using before bed like I do. Overall, I love that it works. It really does give long-lasting moisture for my really dry skin and it makes my skin smoother. But, it's really hard to deal with how greasy it is. If you would like to try it out for yourself, you can purchase Pure Raw Shea Butter right now from Amazon!